Alejandro Hernandez-Valdez, Artistic Director of the Victoria Bach Festival. Aeolus Quartet performs on June 6. 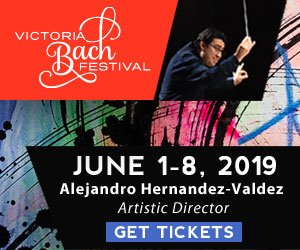 For one week each June, the picturesque South Texas city of Victoria, population 65,000, rolls out its red carpet and welcomes some of the finest professional musicians from around the country to take part in the Victoria Bach Festival (VBF). This summer, the 42nd annual VBF (June 6-10) will usher in a new era of outstanding music-making when Artistic Director Alejandro Hernandez-Valdez officially takes the helm, succeeding now Conductor Emeritus Craig Hella Johnson, who led the festival from 1992-2015. Founded in 1976 by then Professor David Urness of the University of Houston-Victoria as a modest community celebration of the music of J. S. Bach, the festival has expanded significantly over the years, drawing professional musicians from coast to coast with a mid-sized orchestra, a Baroque string orchestra, and a choir, as well as guest artists and chamber music ensembles. Executive Director Nina Di Leo marvels at the wide and eclectic range of music offered in just 5 days: “We have featured large Baroque oratorios with 240 performers, intimate Bach Cello Suites at the local coffee shop, new music concerts featuring the music of Philip Glass and Joan Tower, and chamber music concerts in historic venues like the Presidio la Bahia in Goliad.” Although it is true that the festival has evolved from its Baroque beginnings to be inclusive of much more, Di Leo maintains that preserving the festival’s middle name not only reflects its roots, but demonstrates the festival’s high regard for Bach’s spirit of invention and standard of excellence in music-making. Bach continues to be a central guiding figure and source of inspiration for the festival. 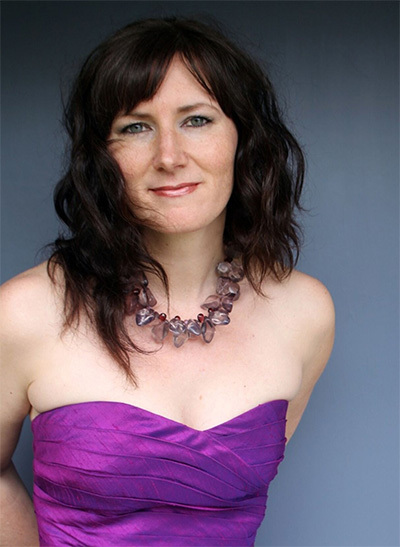 Michelle Schumann performs on June 7. Maestro Hernandez-Valdez, who serves year-round as Artistic Director of the New Orchestra of Washington as well as Musica Viva in New York City, will also bring plenty of East Coast talent with him this year. 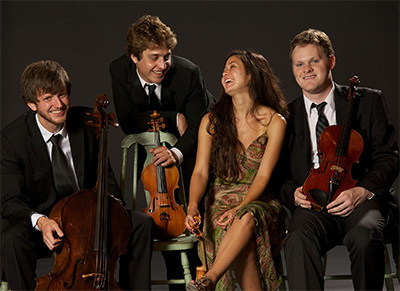 Opening night at the festival will feature the young and accomplished Aeolus String Quartet, recent prizewinner of nearly every major chamber music competition (Plowman, Yellow Springs, Fischoff, Coleman), Graduate Resident String Quartet at Julliard from 2013-2015, and now the resident ensemble at Musica Viva. This will be a Texas homecoming of sorts for the quartet. Before its now bustling major-league career, Aeolus spent two years under the tutelage of the masterful Miró Quartet at the University of Texas Butler School of Music as the school’s first graduate quartet-in-residence. 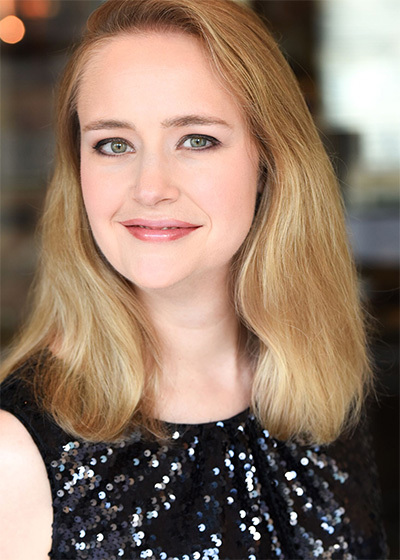 Renée Anne Louprette, a superstar organist from New York City, will thrill the audience with the transcendent organ works of J. S. Bach at a Bach at Noon solo concert. A Bach and French music specialist, she is one of a few select organists who have been invited to perform at the Notre Dame Cathedral in Paris, an exceptional and much-coveted honor. The Victoria Bach Festival is at heart a celebration of community. More than two-thirds of the festival concerts are free of charge. Open rehearsals and post-concert chats with musicians further enhance the bond between the audience and the performers. The popular Bachfest Breakfast concerts at the Liberty Coffee House are programmed and led by select musicians from the festival orchestra; the public library hosts family-friendly music workshops for participants of all ages; and for one evening in historic DeLeon Plaza, adjacent to the Victorian bandstand on the open lawn and the beautiful Romanesque Revival 1892 Courthouse, the Flamenco Symphony, based in Austin, will light up the night with nuevo and traditional flamenco. Renée Anne Louprette performs on June 8. Everyone involved in the festival talks passionately about the strong community support throughout the years that has nurtured the festival to artistic excellence and financial stability. Dr. Michael Hummel takes the responsibility of serving on the Board very seriously: “We are trying to run this organization at the same high quality that we are getting from the musicians. They make it a challenge for us because they are so good, but we aim to be just as good from the Board side.” Community members open their homes to the musicians, and strong friendships have developed over the years. Principal cellist Greg Sauer, Associate Professor of Cello at Florida State University, has been coming to Victoria for the past 10 years. His favorite thing about the festival is the sense of community involvement. “So many of the people living here consider the festival as a part of the fabric of their lives and they act accordingly, with support in every possible way,” he says. Another unique aspect of VBF is the Emerging Artists program begun in 1992 by former Artistic Director Craig Hella Johnson. 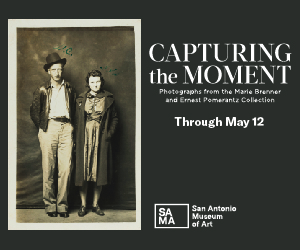 Each summer, two young artists are chosen through a nationwide application and audition process, and participate in the festival in a variety of ways. Faith DeBow, Emerging Artists Coordinator, guides the young artists in programming and performing at least one formal recital, in addition to 4-5 performances in non-traditional and educational settings all over the city. “The goal of the program,” explains DeBow, “is to provide performance opportunities, exposure, and networking for outstanding artists who are just beginning their careers. All of the past Emerging Artists now enjoy thriving professional careers, and many have won notable awards (Grammys, international competitions, etc.) very soon after their appearances in Victoria. Many of them return in future years as VBF performers as well.” The 2017 Emerging Artists are Emily Klein, harp (Houston, TX) and Dillon MacIntyre, trombone (Evanston, IL). Maestro Hernandez-Valdez is well aware of the artistic excellence and enduring legacy of Craig Hella Johnson’s tenure at the Victoria Bach Festival. After leading the festival for an extraordinary 23 seasons, Johnson stepped down as Artistic Director in 2015. He continues to perform in Victoria with his Grammy-winning choral ensemble Conspirare and supports the festival in his new role as Conductor Emeritus. Hernandez-Valdez is passionate about the future of VBF, and sees potential for even more growth. “The bones of the festival are so strong,” he says. “It’s a well-oiled machine. The potential for growth is quite large, not only because of the caliber of the musicians but also the caliber of the people who support it, the amazing people who care so much about this very intense week of music-making.” Hernandez-Valdez, born in Mexico, is particularly excited about connecting to the sizable Latin American community in Victoria. He will showcase the music of the land of his birth on the grand finale concert of the festival—Mexico Bello, tracing the musical and cultural history of the country through Pre-Hispanic, colonized, and modern Mestizo Mexico. “There will be enchantment,” the Maestro promises, “in Silvestre Revueltas’s Sensemayá, based on an ancient snake charming ritual.” There will be Carlos Chavez’s one movement Sinfonía India which gathers Mexican street dances of all sorts to form what the Maestro calls “a beautiful cacophony.” There will be an arrangement of a Buxtehude chaconne by Chavez to represent the European influence in colonized Mexico. There will be the hugely popular Huapango by José Pablo Moncayo, which is so close to the heart of the Mexican people that it is widely recognized as the unofficial National Anthem. And there will be a U.S. premiere of Juan Pablo Contreras’s prize-winning composition Mariachitlán (The Land of Mariachi). 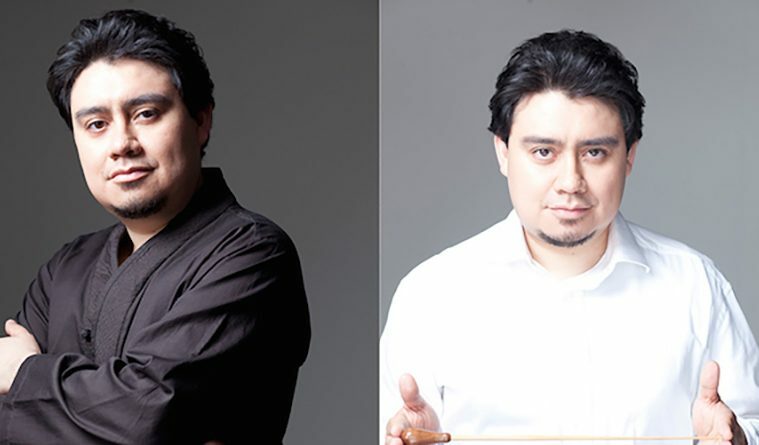 Contreras is one of the most prominent young composers of Latin America today, and his music is the perfect fusion of contemporary classical music and Mexican popular and folk music. 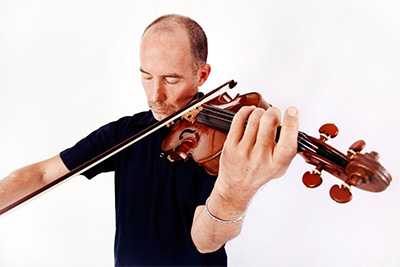 The city of Victoria feels transformed each summer during the Victoria Bach Festival. There is a buzz in the air, the expectant joy of a remarkable musical experience about to be shared by the entire community. For the musicians, it is a special reunion of extraordinary artistry, of fellowship with colleagues and friends, of playing together so intensely this one time each year for the community whose love and support make it all possible.